LinkedIn is no doubt one of the world top professional social platform where employers and job seekers meet while host of Others showcase their skills and services through the platform. It is however one of the respected professional social media platform. 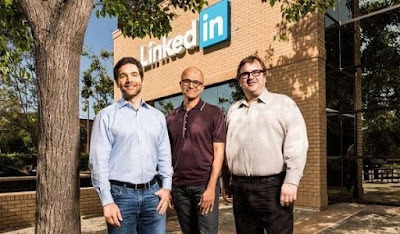 Interestingly, Microsoft just announced a $26.2 billion deal to acquire LinkedIn. According to the official statement , Jeff Weiner will still maintain his office as the CEO of LinkedIn and will report to Microsoft CEO, Satya Nadella. It is however reported that the deal has been stylishly approved by both parties, although the acquisition still needs approval by LinkedIn shareholders and regulators in the company. Well you can trust us to give you the full gist as soon as we have them, so we advice you Keep calm keep visiting as we will update you on any latest development regard this.